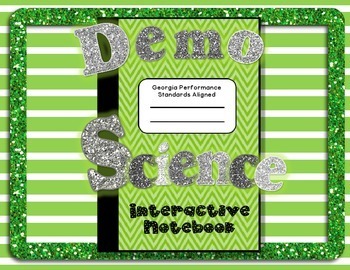 Demo Science Interactive Notebook aligned to Georgia Performance Standards. This is a great free product for getting your students excited about Science! S3P1 Students will investigate how heat is produced and the effects of heating and cooling, and will understand a change in temperature indicates a change in heat. S3L1 Students will investigate the habitats of different organisms and the dependence of organisms on their habitat. S3E1 Students will investigate the physical attributes of rocks and soils. S3E2 Students will investigate fossils as evidence of organisms that lived long ago. It also provides a great start to a science notebook with foldables for answering who a scientist is, what a scientist does, and what a hypothesis is. These foldable materials are great for encouraging creativity among your students while delving into high level material and practical, easy experiments. These materials work great with a lapbook or interactive notebook, but can also be used with any notebook/folder in order to provide a more hands-on experience. *This product is meant to go along with a current Science textbook/close reading passages. It does not include reading materials, but provides the materials that are correlated to the Scientific reading material. Includes 16 sets of foldables for use, along with pages/pictures of foldables. It also provides an excellent preview of my paid interactive Science notebooks, if you are interested in purchasing them.